-Jorge Linares comfortably outscores Mercito Gesta to retain his WBA light title. Arroyo Secco, Argentina: Super Light: Gustavo Lemos (14-0) W KO 4 Ruben Lopez (12-10-3). Lemos scores kayo with a blistering combination in the fourth. The young local boxed cleverly at a distance in the first with Lopez pressing but not being able to get past the jab of Lemos. In the second and third Lemos landed some rights to the head and cracking hooks to the body. He ended it in the fourth. As they traded punches Lopez landed a good right but a right to the head from Lemos stiffened Lopez’s legs and another right put him down on his back and the fight was over. The 21-year-old El Electrico” wins the vacant IBF Latino title and moves to five wins by KO/TKO. Lopez, a former interim IBF Latino champion and Argentinian title challenger, had won 3 of his last 4 fights. Managua, Nicaragua: Light Fly: Felix Alvarado (31-2) W RTD 3 Sebastian Sanchez (12-5). Bantam: Melvin Lopez (13-0) W KO 2 Aramis Solis (16-7). Alvarado makes a good start to the new year as he brushes aside Mexican Sanchez. The Nicaraguan went to the body immediately and landed some rib-benders in the first round. In the second left hooks to the body put Sanchez down twice and another body punch had Sanchez down in the third with the Mexican’s corner retiring their man at the end of the round. Alvarado managed to keep focused despite fights breaking out in the crowd with Alvarado’s family involved. The 28-year-old Alvarado suffered back-to-back losses in challenges for the secondary WBA light fly title against Kazuto Ioka in 2013 and Juan Carlos Reveco in 2014. Since the loss to Reveco he has scored 13 wins a row,12 of them by KO/TKO, including a stoppage of Thai Fahlan Sakkreerin in an IBF eliminator which now has him in No 1 sot so in line for a third title shot. Second loss by KO/TKO for Sanchez who has lost his last 4 fights but against tough opposition in the shape of Paul Butler and Cristofer Rosales. Lopez gets another inside the distance win. The 19-year-old local prospect floored Mexican Solis in the first round and again in the second. Solis claimed that the second round knockdown came from an illegal punch and refused to continue. Lopez now has 9 wins by KO/TKO. He turned pro at 17 after winning schoolboy and youth titles in Nicaragua and has the backing of Roman Gonzalez and four-time world title challenger Julio Gamboa. Solis has lost 3 of his last 4 fights but he too has been matched tough losing to both Andrew Moloney and Tyson Cave recently. Glasgow, Scotland: Heavy: Gary Cornish (25-2) W TKO 1 David Howe (14-7). Super Welter: Marc Kerr (11-1) W PTS 8 Lewis van Poetsch (7-59-1). “Highlander” Cornish floors Howe three times for a quick win. Cornish had Howe on the floor in the first 30 seconds. He landed a right but then pushed Howe down and threw a punch when Howe was falling. The referee did not apply a count due to the push but did warn Cornish. When the action resumed Cornish immediately landed another right which floored Howe. This time there was a count. Howe was up at five but looked very shaken. Howe tried to come forward behind his jab but two more rights to the head saw him slump forward and down on his knees. Again he was up at five but after the count rights from Cornish put him down for the third time and the referee waived the fight over without a count. All over in 89 seconds. The 30-year-old, 6’7” (201cm) Cornish gets win No 13 by KO/TKO. This was Cornish’s first fight since losing a very close verdict to Sam Sexton for the vacant British title in October. The 37-year-old 6’8” Howe has lost in quick time against Nathan Gorman, Dave Allen and in 40 seconds against Daniel Dubois. Kerr overcomes his disappointment to score win over van Poetsch The tall Glaswegian was to have fought Mike McGurk for the vacant Scottish Area title but an injury to McGurk meant that fell through and he had to face journeyman van Poetsch. “Magic” Kerr got the win but as usual van Poetsch proved a stubborn opponent and took Kerr the full eight rounds although losing the unanimous decision. Kerr makes it six wins in a row and will be hoping that the Scottish Area title fight can be resurrected. Melrose, MA, USA: Super Welter: Greg Vendetti (17-2-1) W PTS 8 Derek Silveira (13-2). Vendetti retains the New England title with unanimous decision over local rival Silveira. The 27-year-old “Villain” won on scores of 78-74 twice and 77-75. That makes it 13 wins in a row for Vendetti. Silveira, a former double New England champion had won his last 5 fights. New York, NY, USA: Super Light: Anthony Karperis (15-3) W PTS 10 Nelson Lara (17-10-4). Karperis beats late substitute Lara in a classic small hall fight. Karperis boxed on the back foot catching Lara with accurate jabs and digging in left hooks to the body. Lara was coming forward the whole fight pressurising but Karperis grew in confidence as the fight progressed, he was getting home sharp left uppercuts and frustrating Lara’s attacks with good ducking and weaving. Lara did his best to cut down space but was too slow. He did have success in the eighth and they traded hard shots but some concern over the punishment Lara had taken saw him have to pass the ringside physician’s inspection at the start of the ninth. Both landed heavy stuff and both were rocked in the round and they fought hard to the bell in the tenth in a very entertaining scrap. Scores 99-91 twice and 100-90 for Karperis. The 29-year-old from Hicksville (yes there is such a place) has won 4 of his last 5 fights. Nicaraguan Lara provided everything you hope for from a late substitute-lose but fight hard all of the way. Philadelphia, PA, USA: Light: Steven Ortiz (8-0) W TKO 2 Joshua Davis (11-3). Super Welter: Jaron Ennis (18-0) W TKO 4 Gustavo Garibay (13-10-2). Cruiser: Kennedy Katende (3-0) W PTS 6 Lyubomyr Pinchuk (4-1). Super Middle: Edgar Berlanga (7-0) W KO 1 Jaime Barboza (19-14). Hot prospect Ennis much too good for experienced Mexican Garibay. Ennis controlled the fight from the start. Garibay tried to take Ennis out of his comfort zone but the young member of the Ennis boxing fraternity stayed focused and raked Garibay with an assortment of punches until the referee stepped in to save Garibay in the fourth. The 20-year-old is the brother of Derrick and Farah Ennis. A National Golden Gloves silver medal winner and USA Youth Champion he almost made it to Rio beating Gary Antuanne Russell in the first series at the US Olympic Trials but Russell evened things up with a win and then beat Ennis in a box-off. He turned pro immediately after the Trials and has wasted no time with eight wins in eight months in 2016 and nine wins in 2017. He has now won eight in a row by KO/TKO. One to watch. Garibay, 37, the Mexican champion, has lost three on the bounce. Olympian Katende gets unanimous verdict over Ukrainian Pinchuk. In a close entertaining scrap Katende took control early and floored Pinchuk in the first round. Katende did enough to take the next two but then had to hold off a strong finish by Pinchuk to get the decision. Scores 59-54 twice and 58-55 but it looked closer. Katende, 32, was born in Uganda but moved to Sweden at the age of 12. He represented Sweden at the 2008 Olympics but lost to Artur Beterbiev in the first series and he represented Uganda in Rio in 2016 but lost to Joshua Buatsi. Good pedigree but he has left it too late to turn pro. The 21-year-old Pittsburg-based Pinchuk had won his last three fights by KO/TKO. Berlanga shows he is yet another one to watch as he blasts out experienced veteran Barboza in the first round. The explosive youngster put Barboza on the canvas with a corrosive right uppercut which practically ended the fight. Barboza made it to his feet but only briefly as a left hook followed by right cross put Barboza down again to end the slaughter. The 20-year-old New Yorker, a silver medal winner at both the US Junior Olympics and the USA Youth Championships, turned pro at 18 and has won all seven of his fights inside the first round. Barboza, 39, is way past his sell date. He lost on points to Brian Magee for the interim WBA super middle title in 2011but has slipped a long way and this is his sixth loss in a row. Harare, Zimbabwe: Heavy: Elvis Mayo (7-5-2) W PTS 10 Knife Didier (6-3). Bantam: Tapiwa Tembo (9-5-1) W TKO 4 Swedi Mohamed (12-5-2). Mayo retains his WBF African title with points win over former MMA victim Didier. Mayo, 30lbs heavier used that extra strength to bull Didier in a slow scrappy and gruelling contest. Neither fighter is remotely fast but they battled hard with Mayo coming out the clear winner. Scores 100-91, 99-91 and 98-92 for the “Bulawayo Bomber”. The 34-year–old Zimbabwean has been a pro since 2008 and won the WBA African in 2013 with a victory over Osborne Machimana. He was then inactive for almost four years before returning to action in 2017 and this is his third win since then. At just 6’1” but weighing 278lbs (126kg), he is never going to be anything but a local or minor sanctioning body champion. Didier, from the DRC, but based in South Africa, had won his last three fights but against opponents with just four wins between them. Zimbabwean “Shotgun” Tembo wins the fight but comes in 3lbs over the limit so the WBF African title remains vacant. Tembo, 27, had height and reach over the diminutive Mohamed and gets his sixth win by KO/TKO. He has done most of his fighting in South Africa but this is his second win since returning to action in his home country. Tanzanian Mohamed, 23, had lost inside the distance to a rated Thai last time out. Mar del Plata, Argentina: Super Middle: Ezequiel Maderna (26-4) W PTS 10 Martin Rios (22-14-4,1ND). “El Olympico” Maderna regains the national title with comfortable revenge victory over Rios. Maderna just edged the first three rounds but then started to really dominate from the fourth. He was getting through with jabs and sharp right uppercuts. Rios started the fifth by scoring a hard combination but Maderna bounced back with more uppercuts to take the round. Maderna was on top in the sixth and seventh and rocked Rios with two rights to the chin. Right crosses and uppercuts saw Maderna take the ninth and he wrapped things in the last as a hard jab sent the champion’s mouthguard flying. Scores 99-95 twice and 99-96 for Maderna. The 31-year-old former Argentinian champion Maderna lost a split decision to Rios in a fight for the vacant title in February last year which is his only loss to a fellow Argentinian. His other losses have come against Edwin Rodriguez, Thomas Oosthuizen for the IBO title and Artur Beterbiev. Rios, 25, is now 1-4 since that win over Maderna including an unsuccessful challenge for the Argentinian light heavy title. Deurne, Belgium: Cruiser; Yves Ngabu (19-0) W RTD 3 Geoffrey Battelo (32-6). Welter: Meriton Karaxha (18-4-1) W RTD 7 Anthony Polizzi (3-3-2). Ngabu makes easy work of defending his European title against fellow Belgian Battelo. Ngabu took the first round out jabbing the veteran although he was momentarily shaken by a right. A right to the head dropped Battelo to his knees in the second and he was floored again and only just survived. Another knockdown in the third saw the towel come in from Battelo’s corner. First defence of his European title for 29-year-old Ngabu. He combines two careers also being a pro footballer with KSV in the Belgian football league. Battelo helped Ngabu when the champion first turned professional. Battelo, 38, won the vacant European Union title in May 2016 but that was his last fight before making this challenge and did not look to be in good condition and this was very much a below standard European title fight. Calgary, Canada: Super Light: Zab Judah (44-9,2ND) W PTS 10 Noel Mejia Rincon (21-14-1,1ND). Middle: Albert Onolunose (22-1-1) W PTS 8 Victor Palacios (16-17-2). Judah returns to the ring with a points win over Rincon. The 40-year-old former champion showed some touches of his old skills slotting home fast, accurate jabs and firing quick combinations. He was momentarily inconvenienced by a low punch in the third and a series of punches that had his nose leaking blood in the fourth but apart from that Judah had too much skill and experience and took nine of the ten rounds. Scores 99-91 for Judah from all three judges. After losing to Paul Malignaggi for the vacant NABF welter title in December 2013 the former three-time super light and welter champion was out of the ring until returning with a win over Jorge Luis Munguia in January 2017. He then dropped out of action again until this fight. He has committed to continue his comeback with fights in Canada. Mexican Rincon is 3-5 in his last 8 fights with all five losses coming in visits to Canada. Onolunose continues his attempt to give his stuttering career another run and outpoints Palacios. After four competitive rounds that all went to Onolunose the Nigerian-born fighter came close to ending things with three rapid knockdowns from body punches in the fifth round. Palacios survived to give Onolunose eight rounds of useful ring time. Scores 80-70 twice and 79-71. Now 37 Onolunose, the brother of former IBF middleweight title challenger Ermosele Albert, looked a real prospect when he won his first 18 fights before losing to journeyman Grady Brewer in 2009. He was then inactive in 2010 and had just one fight each in years 2011, 2012 and 2013 and did not fight again until returning in October with a draw against Janks Trotter. Palacios, 38, has now gone 0-8 in fights in Canada over the years. Hellesdorf, Germany: Super Welter: Denis Krieger (14-5-2) W TKO 8 Robert Maess (21-1). This was definitely not in the script as Krieger was brought in just to add another win to the home fighter’s record on a show promoted by Maess manager. Krieger had a game plan laid down by his trainer Khoren Gevor and he followed it over the first few rounds boxing well behind his jab. He then forgot the plan for a while and Maess looked on the way to preserving his 100% record. An ear-bashing from his corner put Krieger back on track and a left hook floored Maess in the eighth. Maess made it to his feet but was put down by another left and the fight was stopped. Krieger, a Moldovan based in Germany, wins the vacant BDB German title with his ninth win by KO/TKO. Big setback for Maess who had been carefully protected up to this point. Accra, Ghana: Light: Emmanuel Tagoe (28-1) W TKO 10 Fernando Saucedo (61-7-3). Tagoe makes a successful first defence of his IBO tile with stoppage of Saucedo but the controversy caused by a bizarre refereeing to some extent detracts from a dominating performance. Tagoe was faster and very much the aggressor in the first with the experienced Saucedo feeling his way into the fight. Tagoe looked dangerous with his rights but a bit wild. He threw a right as Saucedo was moving away and the punch landed on the back of Saucedo’s head. The referee signalled it was not a knockdown but did not warn Tagoe for the illegal punch despite Saucedo indicating it was one. Tagoe then wrestled Saucedo to the canvas. The referee rightly did not apply a count. Again Saucedo returned to the illegal punch issue and belatedly the referee then warned Tagoe. The champion ended the round strongly landing some heavy body punches but after the bell Saucedo’s second approached the referee to complain again about the illegal punch. Tagoe hunted Saucedo down in the second but there were two more punches to the back of the head. As Tagoe attacked at the end of the round Saucedo was caught a couple of times and fell down trying to escape the punches. He indicated he had been pushed but the referee applied a count. He overlooked the fact that Tagoe was standing in the nearest corner. Saucedo complained that he had been pushed and argued with the referee who then deducted a point from Saucedo for arguing. Effectively it was a big 10-7 round for Tagoe. Tagoe’s strength and unconventional style were winning him rounds. The fourth saw the refereeing farce continue. After numerous incidents as the boxer went to touch gloves they were both just short of touching. With his hands still extended Saucedo looked down to see how far apart they were and Tagoe landed a right that put the Argentinian down. The referee applied a count with Saucedo incandescent over what he saw as a sneak punch. It was a pity as Tagoe was showing he was quick and strong and very unconventional. He was throwing punches from wide angles and off the wrong foot and looked dangerous. There was too much clowning from Tagoe but he was dominating the fight with Saucedo only fighting in bursts. Tagoe was well on his way to victory but his exaggerated clowning was turning the fight into a farce. The referee became the story instead of the fight. Saucedo had complained again about punches to the back of the head in the eighth and ninth rounds. In the tenth Tagoe backed into a corner and ducked and weaved as Saucedo threw punches. Tagoe then threw two jabs and as Saucedo ducked Tagoe landed a right to the back of the Argentinian’s head. That punch had Saucedo standing still, looking out into the crowd. Tagoe then landed two more punches to the back of the head that draped Saucedo over the ropes and he slumped to his knees holding the back of his head. As Saucedo climbed to his feet the referee started to count. Saucedo shouted his annoyance and even though the count had only reached four and Saucedo was standing right in front of him and clearly not in any trouble the referee waived the fight over. A pity and a disgrace. Tagoe, 30, was on his way to an undisputable victory and this soured it. Even more when the IBO see the video they should have the honesty to declare a No Decision as three illegal punches in a row should have got Tagoe disqualified. A test for the IBO’s “Honesty and Integrity” banner. It spoiled what was intended to be a high profile showcase for Tagoe. Saucedo was his most experienced foe but he will have to face tougher opposition before we find out how good he is. Saucedo at 36 and after two world title shots is a clever experienced boxer but he has good cause for complaint about his treatment here and it is a pity that he now has the blemish of one inside the distance loss after 70 fights. Riga, Latvia: Cruiser: Olek Usyk (14-0) W PTS 12 Mairis Breidis (23-1). Light Heavy: Yoann Kongolo (11-0) W PTS 10 Andrejs Pokumeiko (16-13-1). Heavy: Otto Wallin (19-0) W TKO 3 Arden Govedarica (6-6). Cruiser: Micki Nielsen (25-1) W PTS 8 Ricards Bolotniks (10-4-1).Heavy: Filip Hrgovic (3-0) W TKO 4 Tom Little (10-5). In an excellent contest Usyk gets majority verdict over Breidis to retain his WBO title and win the WBC title. Both fighters were probing with their jab early. Usyk had a reach advantage but Breidis was able to draw the lead and then come in quickly and score with hooks and did enough to edge a close round. Usyk took this one. He was stronger with his right jab and was banging home straight lefts as Briedis came forward trying to get inside. Breidis scored well with left hooks but it was Usyk’s round. Clearly Usyk’s round. He had his right jab working constantly threading the punch through the guard of Breidis and following through with lefts to the head. A clash of heads saw Usyk step back pawing at his forehead. The referee stopped the action but there was no sign of damage and Usyk continued to boss the action. This was a very close round. Breidis started well moving forward throwing short hooks and sustaining his attacks rather than just going in and out. However Usyk was again landing his jab and straight lefts and just took the round. Breidis started this one with another sustained attack but a couple of left uppercuts from Usyk had him backing off. Usyk then took over. He had Breidis constantly retreating under a shower of jabs and straight rights and just before the bell scored with a neck-snapping uppercut. Usyk continued to dominate the action early in this one. He was down from a push and then Breidis started to get past the jab firing punches inside from both hands and just took the round with his stronger finish. Usyk’s round. For the last two minutes he had Breidis on the retreat and under pressure. Briedis was stuck on the end of Usyk’s jab and being caught constantly by lefts to the head including one that sent Breidis stumbling back to the ropes and he was unable to launch any attacks of his own. The fight was getting away from Breidis and there did not seem much he could do about it. Once again he just could not get past Usyk’s jab and was stuck on the back foot. Usyk worked the jab hard and kept finding gaps for his left and took the round clearly. Breidis did a bit better in this round. He landed a hard right counter early before being again forced back by Usyk’s jab. Usyk had a good spell but Breidis banged back late . It was close but I just went for Breidis. Blood had been dripping from Breidis nose from early in the fight and now he was also cut on his left eyelid. Usyk was in charge in this one. He was not showing any real variety in his work but did not have to. His right jab and left cross were enough with Breidis having no answer to either as he was never able to get on the front foot. Breidis did much better in this one. He made good use of his own jab and threw plenty of right crosses . Usyk scored with his jab but rarely found the target with his left and Breidis did enough to win the round. Usyk started the last as if he was going to take the round as his jab and lefts were again getting through. That changed when Breidis landed a hard right which shook Usyk and had him holding on. Breidis tried to capitalise on that and did most of the scoring from that point to take the round but it was not enough. Usyk will go on to face the winner of next Saturday’s fight between IBF champion Murat Gassiev and Yunier Dorticos in the final of the WBSS tournament. Since Dorticos only holds the secondary WBA title that fight can’t unify the titles. and outpointed Marco Huck and Mike Perez. The 33-year-old Latvian gave Usyk his hardest fight as a pro and he can come again-against anyone except Usyk. Kongolo makes a successful first defence of his WBC International Silver title with big margins on all three cards. Kongolo quickly had the local fighter on the back foot. The Swiss fighter was sharper and had more variety in his work. Just before the bell to end the first round Kongolo landed a left to the head that had Pokumeiko backing into the ropes. Kongolo missed with a right but the Latvian’s right foot slid on the canvas. He went down but the referee rightly indicated it was a slip. Kongolo had taken the first round and he was in charge of the fight for most of the remainder. Kongolo did all of the chasing and although Pokumeiko showed some reasonable defensive skills he did not have the power to dissuade Kongolo. Fortunately for Pokumeiko Kongolo is also not blessed with a big punch and although the Swiss fighter was able to land plenty of left hooks and overhand rights the only time Pokumeiko was in real trouble was in the seventh. In an eventful round firstly Pokumeiko was warned for holding, then he was floored by a left hook before a clash of heads saw a cut opened over his left eye with Kongolo being deducted a point under the WBC rule which says that if a fighter is cut by a clash of heads then the opponent is deducted a point. Luckily the blood was not running into Pokumeiko’s eye but really he was in survival mode after that and did well to last the distance. Scores 99-89, 98-90 and 98-91 all for Kongolo. The European No 9 remains undefeated but he may struggle against better opposition. Pokumeiko was willing but limited. He was 7-0-1 in his last 8 fights but against very modest opposition. Swedish heavyweight hope Wallin adds another inside the distance win. The tall Swede was giving away a little bit of height for a change but had no trouble beating Bosnian Govedarica. Wallin scored well with his right jab and straight lefts in the first and then floored Govedarica twice in the second round. Govedarica survive to the bell but after a body punch put him down in the third the fight was stopped. The 6’5 ½” (187cm) Wallin has 13 wins by KO/TKO. He is part of the Sauerland team and trained by former WBA super feather and light champion Joey Gamache. He is rated WBA 11/IBF 12(11)/WBO 13 but is No 16 with the EBU. Swedish fans are hoping that a Wallin vs. Adrian Granat fight happens soon. Govedarica now has 3 losses by KO/TKO and is 2-6 in his last 8 fights. Nielsen gets a win but fails to impress. The Dane got off to a good start and built an early lead. From the half way mark Bolotniks began to eat into that lead and looked to have done enough to deserve a draw. Scores 77-75 twice and 78-74 for Nielsen. The 24-yeart-old southpaw gets his third low level win in a row since losing a majority decision to Kevin Lerena in the final of Rodney Berman’s Super 4 tournament in South Africa in 2016. It may be that he has trouble getting up for theses routine fights. Local fighter Bolotniks had won his last six fights. Hrgovic gets his third inside the distance win but this time has to go past the first round for victory. Hrgovic used his better skills to boss the first round jabbing well, keeping Little on the back foot and landing a hard right just before the bell. Little gave it a try in the second throwing more punches but Hrgovic controlled the action with his strong jab in this one and the third. Little was cut over his left eye and made the mistake of standing stationary in front of Hrgovic in the fourth. The Croatian landed a couple of thumping rights to the head which stiffened Little’s legs and then sent him staggering back to the ropes. Hrgovic landed a couple more punches and the referee stepped in and made a well times stoppage. The 25-year-old 6’6” (198cm) Croat beat both Joseph Parker and Tony Yoka on his way to winning the World Youth Championships gold medal but lost a split decision to Yoke in the semi finals in Rio. Little had won 6 of his last 7 fights and lasted three rounds longer then Hrgovic’s previous two opponents. Tijuana, Mexico: Feather: Edivaldo Ortega (25-1-1) W Drian Francisco (29-4-1). Ortega gets a win but makes heavy weather of beating the Filipino veteran who finishes the fight strongly. Southpaw Ortega had lots of height and reach on his side and used his jab early to keep the more experienced Francisco on the back foot. Francisco was looking to counter but was too slow. Ortega banged home some hard left hooks to the body and was on top. Francisco did better in the second round showing good skills slotting home left jabs and quick counters. Ortega took the third as he pressed relentlessly and outscored the Filipino. Francisco got back into the fight in the fourth. He was using clever upper body movement to draw the right lead and then countering with quick combinations. Ortega came back to win the fifth and sixth. He was outworking Francisco but with punches that lacked power and not really dominating the fight. Francisco had dropped his guard by the seventh realising that Ortega did not have a dangerous punch. A tired Francisco was looking to turn the fight his way in the eighth. He was loading up on his punches and rattled Ortega with a couple of choice right uppercuts. It looked as though Francisco might pull this one out of the fire as right to the head in the ninth sent Ortega staggering back across the ring. Ortega was badly shaken but Francisco just did not have the speed to cut off the ring and let the chance slip away. The tenth was Francisco’s as he chased down the retreating Ortega managing to land a few good thumps but it was too little too late. Scores 98-92 twice and 96-94 all for Ortega. The neighbourhood fighter deserved the win but those first two scores were a bit too wide. Ortega had scored victories over Roberto Castaneda and Juan Carlos Sanchez but lost his unbeaten tag against Eduardo Ramirez in December 2016. He rebounded in October last year with a win over former WBC champion Tomas Rojas. Unfortunately he is very predictable and lacks real power. Francisco, 35, is nearing the end of the road. He went 20-0-1after turning pro and won the interim WBA superb fly title but lost big fights to Chris Avalos and Guillermo Rigondeaux. This was only his second fight in almost two years and he was down at No 10 in the Philippines ratings. Bukidnon, Philippines: Minimum: Pedro Taduran (12-1) W KO 5 Jerry Tomogdan (24-9-4) . Minor surprise as inexperienced “Rattlesnake” Taduran knocks out fellow southpaw Tomogdan for the Philippines title. The 21-year-old Taduran makes it 9 wins by KO/TKO and six wins in a row. He was No 4 in the Philippines ratings. Champion Tomogdan lost to Wanheng for the WBC minimumweight title in 2015. He was 5-1-1 going into this first defence with the loss being a points defeat against former WBC light fly champion Pedro Guevara. Vitoria, Spain: Super Light: Ignacio Mendoza (43-12-3) W KO 1 Fran Suarez (7-4-1). Mendoza retains the Spanish title with quick finish against Souza. The challenger was boxing with a loose guard holding his left low and paid the price. Late in the round Mendoza stepped in with a right/left cross combination to the head and Souza went down heavily. The referee started to count but stopped at six and just waived his arm to signify the end. Colombian-born Mendoza, 36, was making the first defence in his second reign as Spanish champion and has 27 wins by KO/TKO. Suarez had won his last three fights but this was too big a step up for him. Linares retains his WBA title with yet another boxing master class as he outboxes the aggressive Filipino Gesta. The challenger actually made a good start as it was Linares who showed the aggression and Gesta who scored with some sharp counters and rattled Linares with a southpaw left. Linares pressed again in the second with Gesta catching the eye with a right hook. Linares finally began to roll in the third. He was quicker to the jab and kept shifting around Gesta slipping the Filipino’s punches creating different angles for his counters. Gesta stuck to his task in the fourth but was unable to land anything of significance as Linares slipped and slid around him threading through quick punches from both hands. After four rounds the scorecards read 40-36 and 39-37 for Linares and 38-38. Over the middle rounds too often Gesta was bedazzled not knowing where Linares would strike from next. Jabs, hooks and uppercuts were finding their target and every mistake that Gesta made was punished He received some encouragement as a punch opened a cut on the right eyelid of Linares but the Venezuelan veteran was giving Gesta a lesson in punch timing and placement. After eight rounds Linares was so far in front Gesta needed a stoppage as the cards read 79-73 twice and 78-74 for the champion. Any hopes that Linares might slow were in vain. Gesta got through with some good combinations in the ninth but Linares countered with a right that staggered Gesta. Another big effort by Gesta in the tenth was frustrated by clever defensive work from Linares and fast accurate counters which saw the champion pocket that round also. Over the last two session Gesta was going for broke but Linares outboxed him in the eleventh and then boxed conservatively over the last generously ceding the round to Gesta. Linares was down in the twelfth but it was ruled a slip and he retained his title by wide margins on all three cards. Scores 118-110 twice and 117-111. This was the third defence of his WBA title for Linares and his 13th win in a row. He has plenty of options out there for big fights with Mikey Garcia and Vasyl Lomachenko being mentioned but nothing set. He has come a long way since back-to-back losses to Antonio DeMarco and Sergio Thompson and seems to get better as he ages. Gesta, 30, had lost to Miguel Vazquez for the IBF light title in 2012. Although he went 3-0-1 in his next four fights he was inactive throughout 2016 before returning to action last year with two wins over good level opposition. He got the title shot as he benefited from the mysterious WBA ratings elevator suddenly appearing at No 14 in their November ratings even though he had not fought since July. Matthysse wins the vacant secondary WBA title with dramatic kayo of Teerachai in a fight which until then had not really caught fire. Both tried to get their jab working in the first. Teerachai had slight edges in height and reach and stuck to the jab. Matthysse was on the front foot and showing a bit more variety in his work but Teerachai finished the round strongly. In the second and third Matthysse increased the pace with Teerachai constantly on the retreat but showing good movement and countering with some straight rights. Matthysse stalked Teerachai throughout the rounds and fired some dangerous looking rights but was off target. Teerachai made a fast start to the fourth coming out firing punches and for once it was Matthysse on the back foot. Teerachai managed to land a couple of clubbing shots to the head but then Matthysse began to roll forward again and landed a pair of head punches but he was having trouble hunting Teerachai down and was showing a small cut over left eye. Matthysse had a bit more success in the fifth as he was doing a better job of cutting off the ring and forcing Teerachai to stand and trade. Matthysse continued his relentless forward march in the sixth. Teerachai was using up lots of energy circling the ring perimeter and lacked the punch power to hold Matthysse off and was warned for holding as Matthysse kept pressing. During the interval one of the Commission officials took a concoction being used by Teerachai’s corner and after examining it with the referee returned it to Teerachai’s second. The seventh was a frustrating round for Matthysse as he continued to press hard but by a combination of moving, left jabs and holding Teerachai stayed out of trouble. Matthysse finally landed a right early in the eighth. First he banged home a hard jab and then a right to the side of the head that put Teerachai down flat on his back under the ropes. He lay on his back unmoving for a couple of seconds and then quickly rolled up to his knees and got up at eight. When the action resumed Teerachai tried to punch his way out of trouble but Matthysse forced him back to the ropes. The ending was strange as Matthysse landed a thumping left jab and Teerachai landed a right to the side of Matthysse head but even as it landed the Thai was already falling to the canvas and again he landed on his back half under the ropes. He had obviously been badly weakened by those two punches that caused the first knockdown. The referee promptly waived the fight over. Scores at the end were 69-64 and 68-65 for Matthysse and 68-65 for Teerachai. The Thai was taken to hospital on a stretcher after the fight. 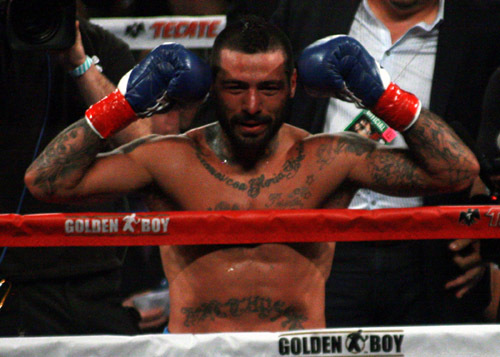 The 35-year-old Matthysse gets win No 36 by KO/TKO. The former interim WBC super light champion moved up to welter after losing to Viktor Postol for the vacant WBC super light title in October 2015. He had been inactive in 2016 but halted Emmanuel Taylor in May 2017. Keith Thurman is the real WBA champion but Matthysse indicated he would like a return with Danny Garcia who took a narrow decision over him in 2013 for the WBA and WBC super light titles but would also like a chance at Manny Pacquiao. Teerachai, 25, had shown quick movement and a fast jab but just lacked the power to keep Matthysse out and paid the price. Despite his No 1 rating by the WBA Teerachai had never faced a fighter even remotely near a rating but at 25 he can come again and would make a good opponent for some of the other rated fighters. Lopez builds on his win over Pablo Cano with kayo of Prescott. Lopez was the fresher fighter with Prescott on the slide. Despite that it was an entertaining scrap with plenty of exciting exchanges. Lopez has spent most of his time fighting at around the light limit but came in at a career heaviest and that helped him against the bigger Prescott. Lopez finally broke through in the fifth flooring Prescott late in the round with a left hook. Prescott beat the count but Lopez drove forward scoring with a series of head punches. Prescott tried to punch with Lopez but a right to the head sent him down on his knees and he was counted out. Lopez, 31, was 29-0-1 before losing his Argentinian title to Pedro Barboza in 2014. His second loss was a split verdict against Michael Perez in April last year but he rebounded with that kayo win over Cano in October. These two wins will see him get more exposure. Colombian Prescott, 34, has now lost four on the bounce. Arnett seems to have changed his name to Pauldo as that is what appeared on his shorts and in the results sheets. Pauldo just had too much skill and aggression for Gonzales but had to fight hard for the win. He was helped by a bad nose injury suffered by Gonzales but despite that Gonzales was competitive all the way. Scores 58-56 twice and 59-55 for Pauldo. The 25-year-old Floridian’s only loss was a points defeat against Eddie Gomez in 2014. He scored an impressive win in November 2015 blowing away Cuban Yudel Johnson inside a round but did not fight again until beating Jorge Silva in July last year and this is his first fight since then. Gonzales lacked the skills and experience to seriously test Pauldo. Duno wipes out Armenta in 61 seconds. The little Filipino was facing an opponent with big edges in height and reach and Cruz was also a southpaw but none of those details had a chance to come into play, Duno came out firing quick combinations forcing Armenta back around the ring. All Armenta managed was a couple of ineffective jabs before a long right cross from Duno thudded into the side of his head. Armenta staggered back into a corner and then dropped to his knees and stayed there for the full count. The 22-year-old “Ruthless” Duno moves to 14 wins by KO/TKO. He signalled his arrival last March with a second round kayo of unbeaten 16-0 Christian Gonzalez and was impressive again here. Seventh loss by KO/TKO for Armenta but the last five have all been against high quality opposition. Martinez continues unbeaten as he climbs off the floor to outslug Flores. Things started badly for Martinez as Flores came out throwing left hooks and backing up Martinez. As they came together Flores landed a left but then pushed an off balance Martinez over. It was not a genuine knockdown and initially the referee was waving his arms to show it was not a knockdown but the timekeeper had started counting so the referee went along with it. Martinez was not hurt but he knew he was already down in the scoring. He made up for that over the following rounds. Flores kept ploughing forward but Martinez made him pay with counter rights and lefts to the body. Flores was being outscored and a punch opened a cut over his right eye in the fifth as Martinez finished strongly to take the decision. Scores 58-55 twice and 59-55. Third win by KO/TKO for the 21-year-old from Dallas. Flores fought hard all the way and is better than his1-10-1in his last 12 fights indicates. Las Vegas, NV, USA: Light: Sharif Bogere (31-1,1ND) W PTS 10 Arturo Santos R. (19-9). Bogere boxes his way to low key victory over Mexican Reyes. Both were too cautious over the first half of the fight with Bogere taking the rounds. Things got better over the second half as Bogere began to press more which suited Reyes who had been too slow to be any danger. Bogere continued to collect the rounds and put in a big late effort trying for a stoppage but it did not come. Scores 100-90 twice and 99-91 for Bogere. The 29-year-old Ugandan “Lion” lost on points to Richar Abril for the vacant WBA title in 2013. He is now 8-0,1ND since then but against very modest opposition and has dropped out of the ratings. Reyes, an Olympic quarter-finalist for Mexico at the 2008 Olympics, has disappointed as a pro and is going nowhere. Fighter of the week: Olek Usyk as he wins his way into the WSBB cruiser final. One to watch: Former Elite level amateur Edgar Berlanga who is 7-0 with 7 first round wins with honourable mention to Filipino Romero Duno .